The delicious vanilla flavor that we all love so much comes from an orchid. This is the sensational and noble vanilla orchid. 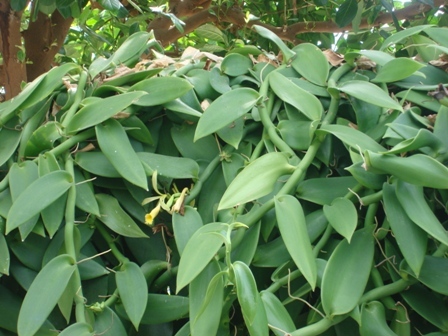 The vanilla orchid grows in warmer, tropical climates. I have quite a few of them growing around my house in zone 9b. However, we had several nights of low 20 degrees fahrenheit temperatures this year and my vanilla orchids are unscathed. They have protection from the overhang of the house because they are growing on the house, so that must have helped. I didn’t try to cover them or put lights on them. I figured they would survive, or they wouldn’t. 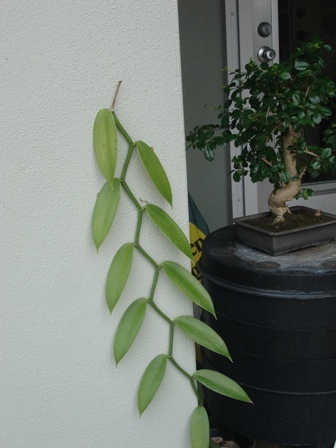 This is a vanilla orchid growing on my house. It is not invasive and is slow-growing. I wouldn’t mind if it was invasive. This particular plant was growing beautifully on this section of wall but I had to remove it to paint the house. I started it again with a small cutting and it’s growing again. The vanilla orchid grows a beautiful flower that turns into a fruit. Some call it a vanilla pod or vanilla bean, but it is actually a fruit. 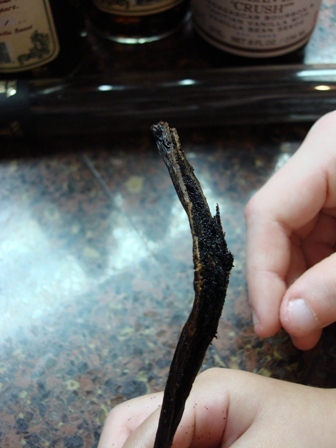 When the vanilla bean is sliced down the middle with a knife it exposes thousands of tiny vanilla seeds. The aroma of this is intoxicating. So yummy! There are endless ways to use these seeds in your food. I like to scrape the sticky seeds out with a knife and add them to a large jar of sugar. As the seeds dry out in the sugar, they lose their stickiness and mix better. They dry fast. We use the sugar in coffee, cereal, tomato sauce, lemonade, and well…everything. Here’s the bad news…it is unlikely that you would ever get your vanilla orchid to produce a fruit. However, it can be done. The vanilla orchid (Vanilla planifolia) is native to Mexico and it only blooms one morning of the year for pollination. It can only be pollinated in nature by one insect… the extremely tiny melipona bee that is native to Mexico. This tiny bee knows exactly what to do. Cortez carried the vanilla vine from Mexico to Europe. They were unsuccessful in getting a vanilla bean from it in Europe for 300 years. A twelve-year-old, French-owned slave discovered the flower could be hand pollinated in 1841. 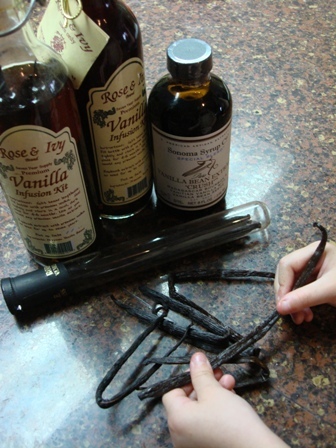 Some of the world’s best vanilla comes from Mexico, Madagascar, Tahiti, and the West Indies. Each country has vanilla that has its own unique flavor. It takes a vanilla connoisseur to be able to tell the difference. I love collecting the beans from different countries to see if I can distinguish the difference in taste and aroma. 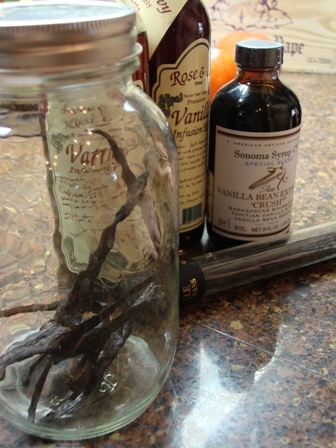 Vanilla beans can be ordered off the internet and usually bought in your local grocery store. The Vanilla Company has tons of information about vanilla on their website and plenty to order. To store them, they should be wrapped in wax paper and stored in a jar with a tight-fitting lid. Vanilla beans are expensive. Never throw a vanilla bean away. After you scrape out the seeds, add the bean to a jar of anything you want infused with a vanilla flavor. You can even put the ends of the bean that are cut off into a jar. After I scrape out the seeds, I add mine to a small jar of vodka. It can marinate that way for years and you will always have a homemade supply of vanilla extract. 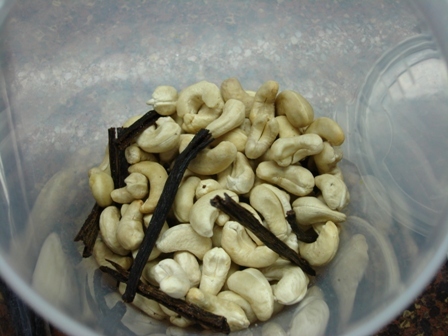 Sometimes I add the vanilla bean to a container of nuts, such as cashew or macadamia. There are millions of ways to use a vanilla bean. I found an interesting fact on vanilla in Jamaica. It grows beautifully there and it is all exported. Apparently they are setting aside some land to grow it for the local Jamaican market as well. The next time I am in Jamaica I plan on seeking out the Elan Vanilla Farm in the Canewood District and begging for a glimpse. For now, we will just enjoy our vanilla orchid as a beautiful orchid growing on our house. It is the only plant my husband will allow to grow on our house, so it must be special.